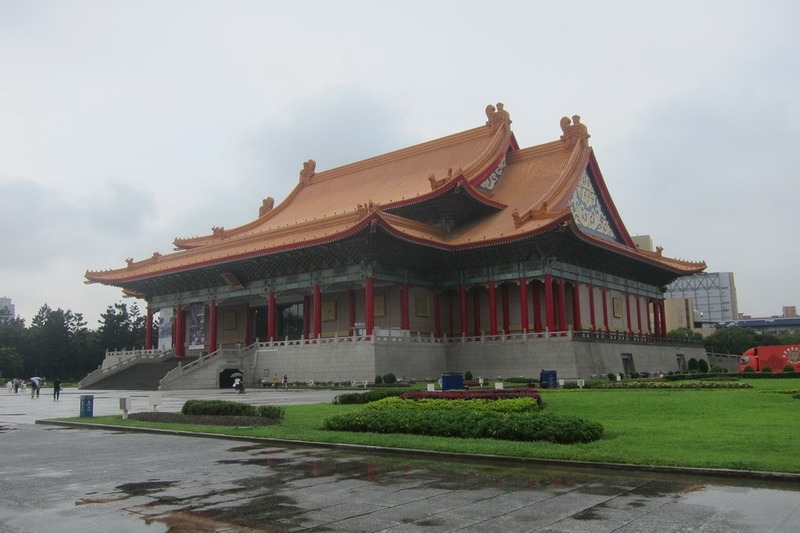 It turns out we did so much eating in Taipei that I couldn’t fit all of the restaurants into one post. If you missed it, yesterday’s post talked about our favorite savory restaurants in Taipei. Today’s will focus on the sweet side. One of Taiwan’s most famous exports, boba milk tea (or pearled milk tea) has swept the States in popularity. If you are Asian or have Asian friends, chances are you’ve tried this dish. 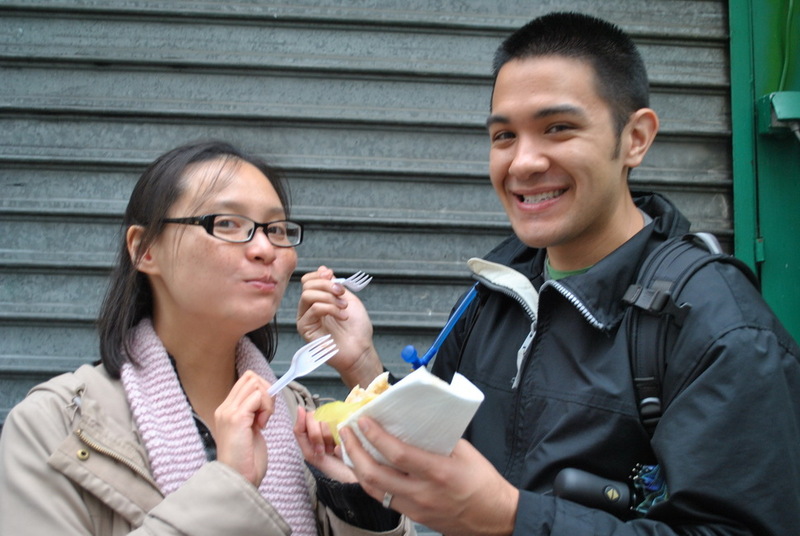 Taipei is known as a mecca for cheap, delicious food. While I touched on some of the Night Market eats on Thursday, in today’s post I’ll talk about some of the better brick-and-mortar restaurants we visited. These restaurants were more expensive than night market stalls, but they were still insanely cheap: $195 TWD (~$6.50 USD) for the cheapest meal, and $506 TWD (~$16.60) for the most expensive. Keep in mind this was for two people and you get a sense of just how cheap good dining can be in Taiwan. Now on to the eats! A well known Taiwanese dish – braised beef is served with noodles in a slowly cooked broth with thinly sliced green onions. On the surface it sounds very similar to Japanese ramen, but Beef Noodles are a horse of a different color. 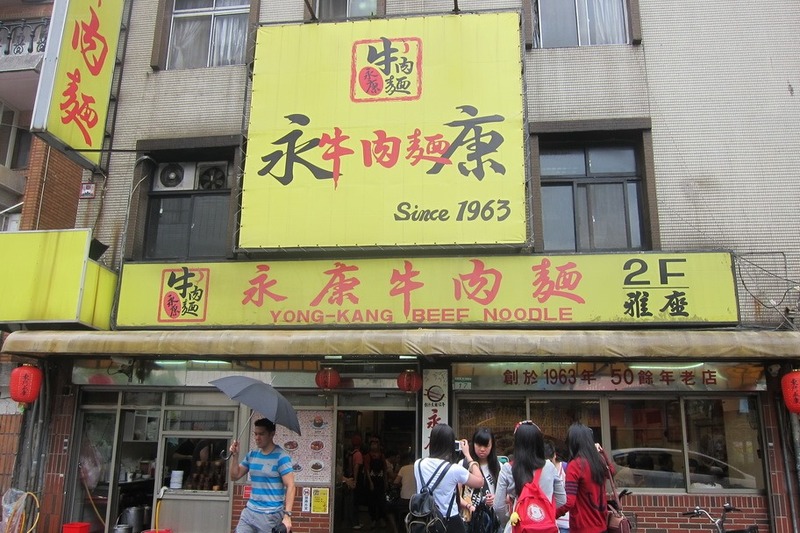 We tried this at two different restaurants: Yong Kang Beef noodle, and Tao Yuan Street Beef Noodle. About a 5 minute walk from the Chiang Kai Shek Memorial Hall, Yong Kang Beef is a simple little sit down joint that offers a variety of different soups. After spending 2 months in Australia and New Zealand, Mrs. Selfish and I were ready for some good ol’ American cheap eats. Something that would satisfy our lust for tasty food without breaking the bank. Unfortunately, while America specializes in cheap meals ($.99 menu, ahoy! ), finding a cheap good meal can be a challenge. Fortunately we once again had access to Yelp, as well as my sister’s local tips. 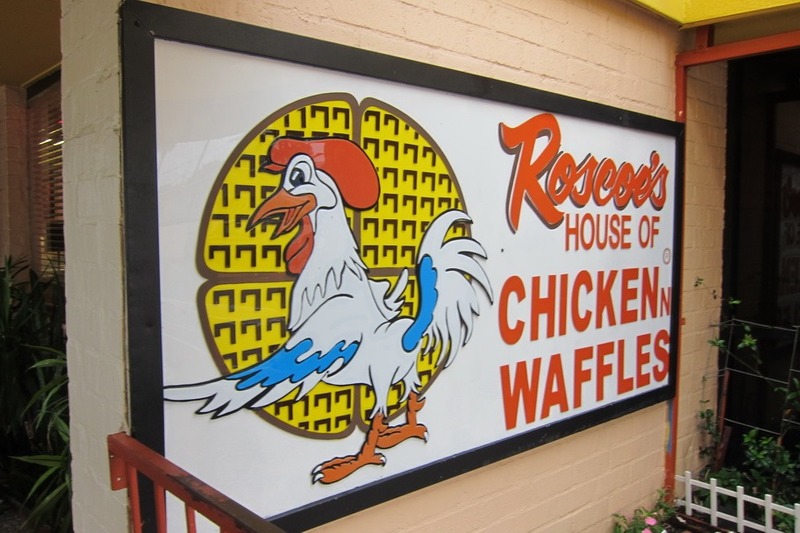 Our first stop in America was Roscoe’s Chicken N’ Waffles, LA’s premiere chicken and waffles location. If you haven’t yet experienced chicken and waffles, then you haven’t lived. 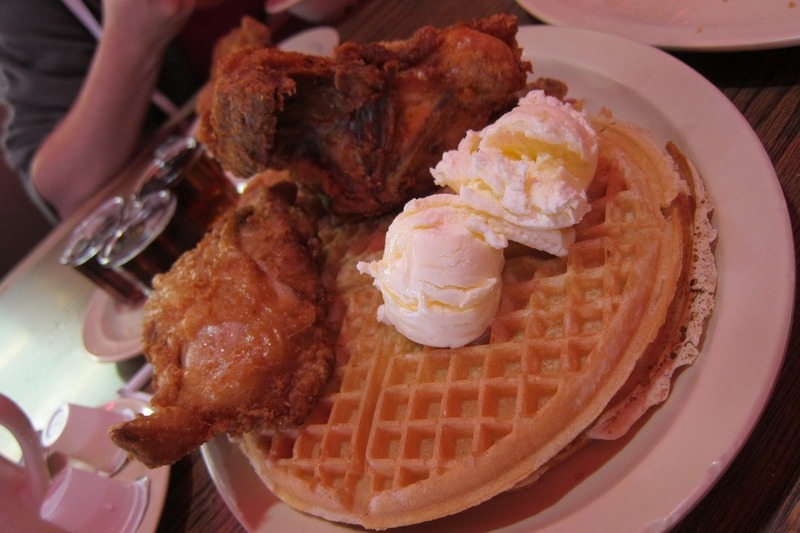 Not the slightest bit healthy, there is something magical about crispy, savory fried chicken on sweet waffles. Mrs. Selfish and I split a half chicken with waffles cooked southern style ($16.10 USD), and ordered a side of Mac and Cheese (~$6), another dish that’s pretty difficult to find outside of the States. The chicken and waffles were amazingly crispy, and every bit as decadent as I remembered. My only complaint was that I hadn’t ordered it with gravy AND syrup, a total rookie error on my part. 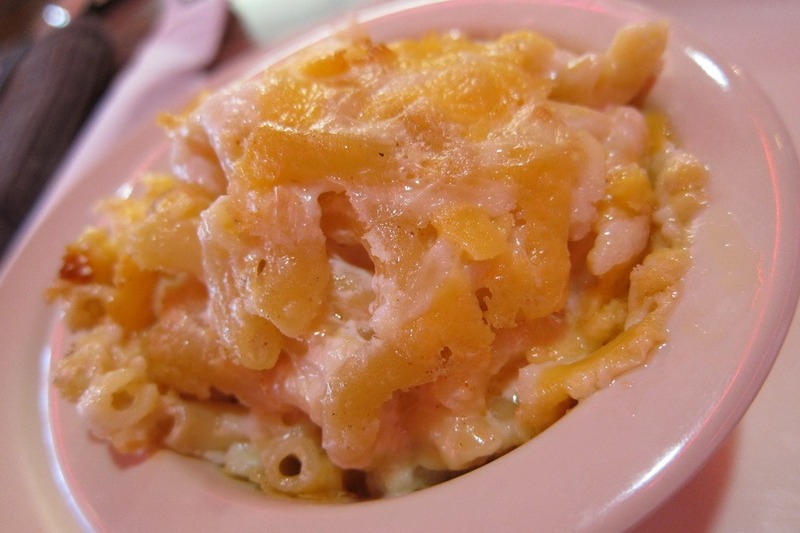 The Mac and Cheese, on the other hand, was probably the best restaurant Mac ‘n’ Cheese I’ve ever had: creamy, smooth, delicious – it definitely hit the spot. VERDICT: Buy it. Try it. Love it. Mr. Selfish and I have been frequenting the 4th Arrondissement. 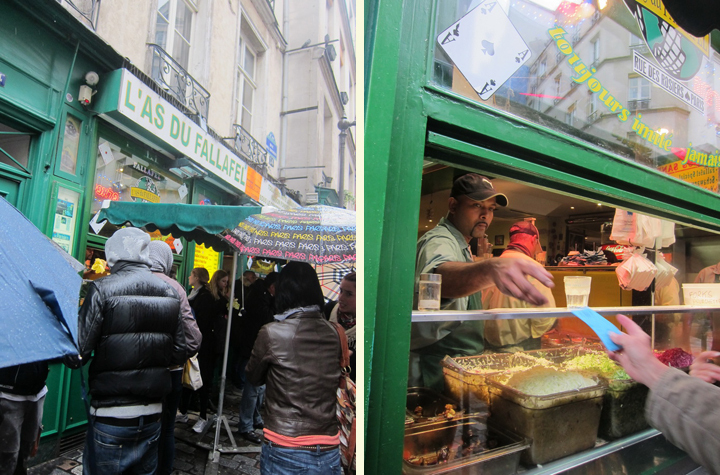 Not only is the beautiful Notre Dame located there but there is also lots of good and cheap food in this arrondissement. 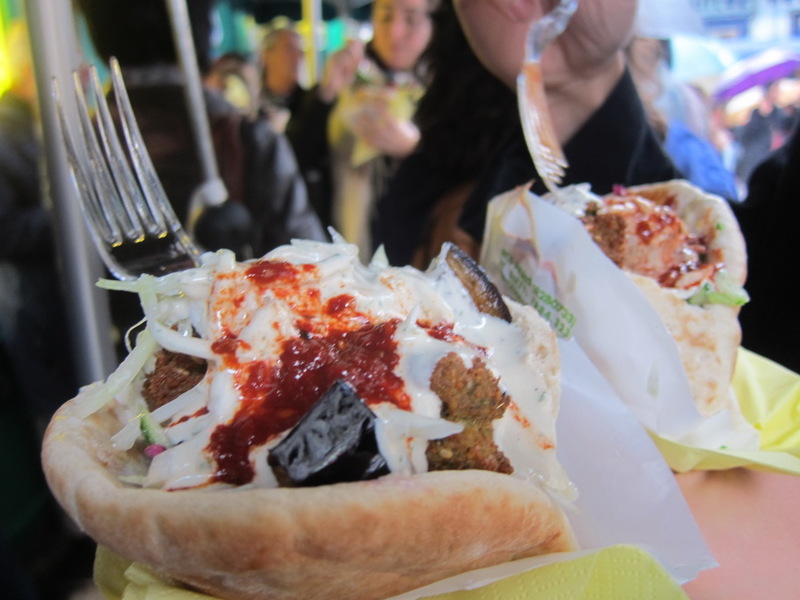 First, we absolutely adore the falafels from L’As Du Fallafel. They are cheap and delicious! The falafels themselves are plentiful and tasty. Plus, the julienne veggies and the thick chunks of eggplant give the wrap a delicious flavor. They also make them spicy, which pleases my palette. 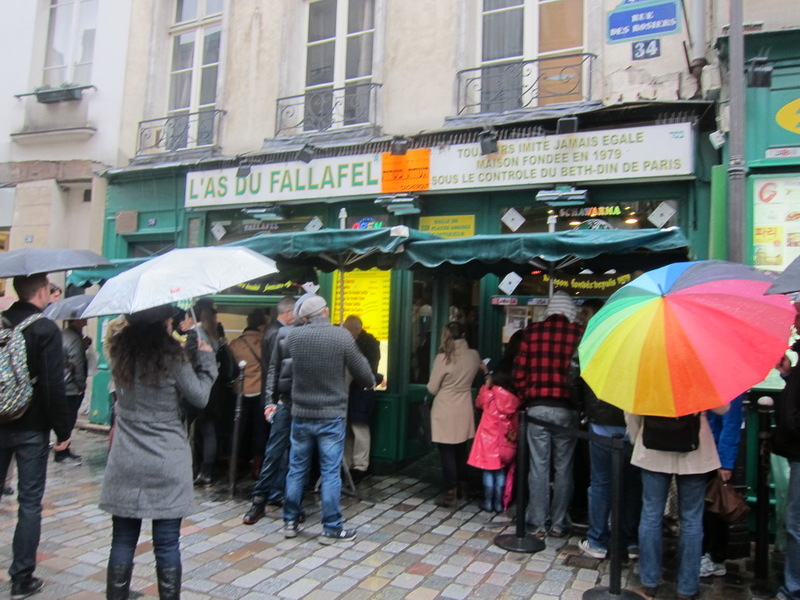 If you’re looking for a cheap and fast eat in this area, you can’t go wrong with L’As Du Fallafel – after all, the sign states that Lenny Kravitz recommends it!